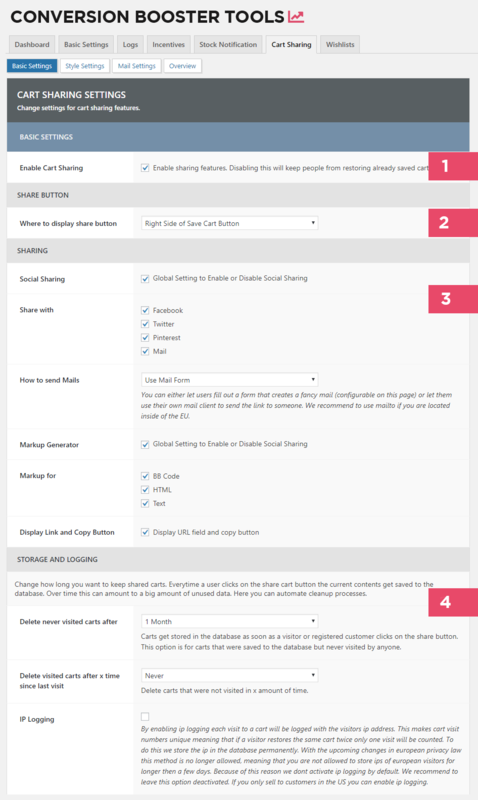 The basic options of the cart sharing feature lets you choose where buttons should be displayed, what sharing features are available and how data stored in the database should be handled. Globally activate or deactivate the sharing feature. If you disable this option no already shared carts can be restored. You can choose between three positions the share button can be displayed. Depending on your theme some of these hooks may not be available. If you change this setting and nothing is showing up in your cart there the hook may not be supported by your theme. You can choose between two options here. Either you let mails be sent by a form the user can fill out or by pointing the user to his own mail client with a link to the current cart being pasted to the mail body. If you choose to send mails through the mail form all mails will be sent out through your server. This may be a problem for websites located inside of the EU in regards to privacy concerns. Please Note: The plugin doesn’t log email addresses carts get shared with. The advantage of using the form is that you have more control over how the shared mails look like. Products get displayed inside of a fancy html table and styled to your liking. Since all carts get saved to the database as soon as a user clicks on the share button your database can get quite cluttered with time. To keep things clean we provide you with several options that delete unused data. Defines the time after which carts that got saved to the database but were never restored get deleted. The plugin comes preconfigured to delete these carts after 1 month, you are free to extend this timeframe by your choosing. Defines the time after which carts that were shared and restored should get deleted. We preconfigure the plugin so that these kind of carts never get deleted. If you don’t want to keep these carts forever consider changing this to 12 months. Since the new privacy rulings inside of the EU it is not allowed to store user data like IP addresses without consent which is the reason wie disable IP Logging by default. If IP Logging is enabled all cart restores will be documented and made unique using the IP address of the user. If the same user restores the same cart over and over again only one restore will be counted. With IP Logging disabled the restore counter will increment with each restore even if its done by the same user. If you are inside of the EU, leave this option disabled. If you serve customers outside of the EU you can enable this setting.